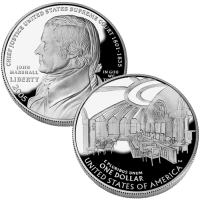 The 2005-P Chief Justice John Marshall Proof Silver Dollar was issued by the US Mint to celebrate the 250th anniversary of one of America’s most revered Chief Justices of the United States Supreme Court. Marshall assumed the post as Chief Justice in 1801 (the fourth person ever to do so since the Supreme Court was founded in 1789) and served in the position for 34 yours participating in many landmark decision along the way. Aside from honoring Marshall, however, the coin also pays tribute to the court itself as well as the entire judicial branch. The Chief Justice Marshall Coin is struck from 90% silver to either this proof or an uncirculated condition. A surcharge is added to the sale of each commemorative by the US Mint with the funds raised forwarded to an organization dictated by the legislation that authorized each coin. Since 1982, over $400 million has been raised in this fashion. Struck from 90% silver, each Marshall Silver Dollar has a diameter of 1.5 inches. The initial price charged for the Chief Justice Marshall Proof Coin was $35.00. Each Marshall Silver Dollar was struck at the US Mint’s facility in Philadelphia and show the ‘P’ mintmark. 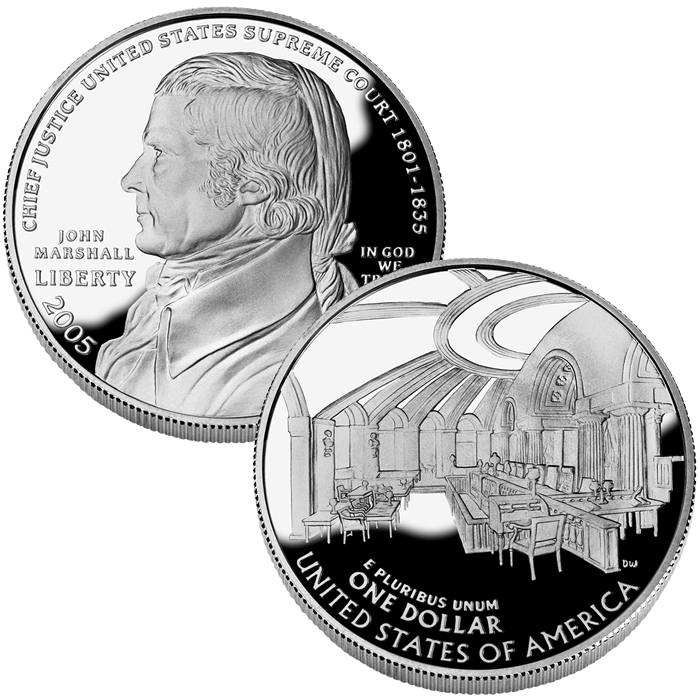 Engraved by John Mercanti, the obverse (heads side) of the coin shows a profile of Chief Justice John Marshall. An image of the old Supreme Court Chamber is shown on the reverse (tails side) of the Marshall Coin. It was engraved by Donna Weaver.